Advanced levels of acupuncture and Chinese herbal medicine are available in Cleveland, Ohio at Acupuncture Associates. Japanese, Tibetan, French energetic, and Chinese styles of acupuncture are combined with moxabustion and herbal medicines to address complex disorders. Tuina, the practice of using gentle pressure with the hands along channels and muscular anatomy, is also very helpful in a variety of chronic painful disorders. Many diseases which are difficult to treat or poorly responsive to Western pharmaceuticals and surgery may be addressed with acupuncture and Chinese medicine. For more than 2500 years, generations of patients and physicians have depended on Chinese medicine for preventative care and basic medical treatment. Chinese medicine can address many problems ranging from simple imbalances to complex medical disorders. The emphasis in traditional Chinese medicine is to treat every person and their particular imbalance in an individualized manner. In contrast, modern pressures to standardize medical practice have resulted in treatments which often neglect the specific symptom complex that the patient brings to the doctor. This trend has become more pervasive as template-based electronic systems have become mandated for almost all medical practitioners in the United States. Nonetheless, the best traditions of both Western and Eastern medicine focus on customizing the treatment to the specific constitution and disorder, which may require a unique approach for each patient. p>The demands of patients for access to these systems of effective and low-risk healing has forced significant changes in the medical system. In contrast to some practices and programs where acupuncture and Oriental medicine are a recently created sideline or an "ancillary service", Acupuncture Associates provides a full time acupuncture and herbal medicine program. Patients should consider the background and experience of a practitioner when considering medical treatment. Guidelines for finding an acupuncturist can be found at our website. Chinese herbal medicine and acupuncture are now available in Cleveland. For an initial consultation to evaluate the imbalaces which may be contributing to your symptoms at our Cleveland clinic, you may visit our site for information and call for an appointment. Alternatively, we can send you informational brochures regarding a number of subjects, such as pain, smoking cessation, fatigue, headache, arthritis, as well as more information on moxabustion, acupuncture, tuina, and herbal medicine. Dr. L.B. Grotte, M.D., was the first physician in Ohio to be board certified in both acupuncture and Chinese herbology. 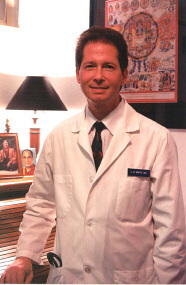 He has studied Oriental medicine since 1972 and has practiced Oriental medicine in Cleveland since 1980. Our small practice specializes in creating individualized treatment plans combining Western and Oriental methods. Call us at 440-461-7488 to make an appointment or visit our website for more information.